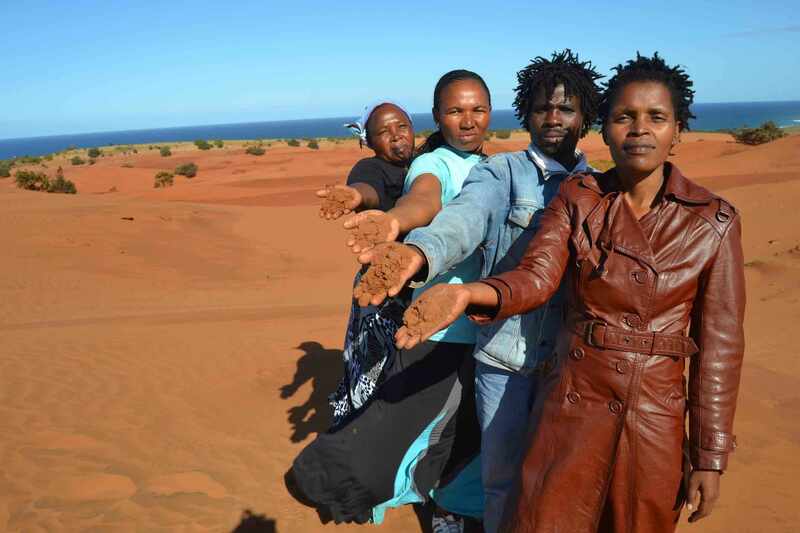 Living on the northern-most portion of the Wild Coast of South Africa, the coastal Amadiba villages have been resisting the proposed Xolobeni Mineral Sands Project for over 10 years through directly confronting attempts to mine, and have also used the very land that is under threat of destruction as a weapon in creative ways. These tactics show us powerful forms of resistance to the state’s political project from above. They also they show us the seeds of alternative, democratic projects from below. In June of this year Minister of Mineral Resources Mosebenzi Zwane unveiled the new Mining Charter, which was met with an uproar by the Chamber of Mines and industry analysts. The core provisions of the Charter relate to increasing the ownership stakes of black empowerment partners in the mining industry. The Charter should therefore be situated within a broader political project that aims to create a black industrialist class, or national bourgeoisie, that will drive national development. The historically central role of mining in the economy and the wealth of resources that still exist underground make mining a key sector on which to build this national bourgeoisie. This project is coupled with the role of the state as a site of accumulation and has inevitably led to the corruption and political crisis we find ourselves in today, typified by the Zupta phenomenon. Major centres of South Africa have recently seen an upsurge of large protest marches in opposition to corruption and the power of the Zuptas. Beyond the mass marches, the protestation of some sectors of capital and other widely reported forms of opposition, one angle is to turn our attention to resistance on the ground to the intersections of fledgling mining accumulators, corruption and the state. We need to look more closely at the communities whose needs the Charter purportedly seeks to address but who had no role in shaping it, and their tactics of resistance to a political project imposed from above as development, but that makes little space for them in it. One place to turn to is the five villages of Section 24 of the Amadiba Area on the Wild Coast. Living on the northern-most portion of the Wild Coast of South Africa, the coastal Amadiba villages have been resisting the proposed Xolobeni Mineral Sands Project for over ten years through directly confronting attempts to mine, and have also used the very land that is under threat of destruction as a weapon in creative ways. These tactics show us powerful forms of resistance to the state’s political project from above. They also they show us the seeds of alternative, democratic projects from below. Australian mining company Mineral Commodities Ltd (MRC), through its local subsidiary Transworld Energy and Minerals (TEM), and its purported community partner, Xolobeni Community Empowerment (Xolco), plans to mine the Xolobeni sand dunes for titanium-related minerals such as the whitening pigment, ilmenite. The dunes cover a 22km stretch of coastline that traverses the five villages of Section 24, known as Umgungundlovu. MRC promotes the mine as a way to socially and economically uplift the Amadiba community that it says is one of the poorest communities in South Africa. But its “community empower partner”, Xolco, was formed without any knowledge of the community in 2003, who only found out about it in 2007. It has come to be associated with the narrow interests of a few and those who formed it are widely believed to be at the centre of coordinating a web of corruption and intimidation against the community. Realising the dispossession and destruction of their land and elite enrichment that the mining would lead to, the five Umgungundlovu villages have steadfastly resisted any attempts to mine. This has come at a huge cost, as families became divided between the vast majority opposed to mining and small numbers in favour. Over the years, leaders of the anti-mining struggle have been attacked and some killed, the latest and most reported-on of which was the assassination of the Amadiba Crisis Committee’s Chairperson in March 2016, Sikhosiphi “Bazooka” Radebe, a day after Human Rights Day. Even journalists from The Citizen newspaper were attacked on the day of Radebe’s funeral while trying to photograph the ilmenite-rich sand dunes. The Amadiba coastal community is also fighting on another front, resisting the construction of the green fields section of the Wild Coast N2 Toll Road through their land. Plans for the road were first mooted after a transnational consortium of private construction companies submitted an unsolicited bid to Sanral in the early 2000s to construct the road through one of South Africa’s most beautiful regions, but also one that has been most neglected by the state. Sanral and the government argue that the road will open the area up to development as a remedy to its neglect. Yet the villages of Umgungundlovu remain firm in their opposition to the road because it will directly affect 40 homesteads and the 80-metre wide, fenced-off road reserve will split the communities in two. They also believe that the road is critical to enable the mining. This situation comes after complicated machinations over the ownership of the proposed mining project that have little to do with the community itself and more to do with collusion between the state, foreign mining capital, domestic economic interests, and some quarters of traditional leadership. In July 2016 MRC announced that it was divesting from TEM and selling its shares to its BEE partner, Keysha Investments, which is wholly owned by Xolco. One year later, however, the actual divestment is yet to take place. MRC’s CEO Mark Caruso and his partner Peter Torre remain directors of TEM. The King of Pondoland, Mpondombini Sicgau, was deposed by Jacob Zuma in 2011 based on the findings of the Nhlapo Commission. His Royal House is an obstacle to the proposed mining and he staunchly defended the right of the Amadiba to say “no” until his death in 2013. Zuma appointed Zanozuko Sicgau as the new King, although in 2013 the Constitutional Court ruled that Zuma had not followed correct procedure in appointing him. 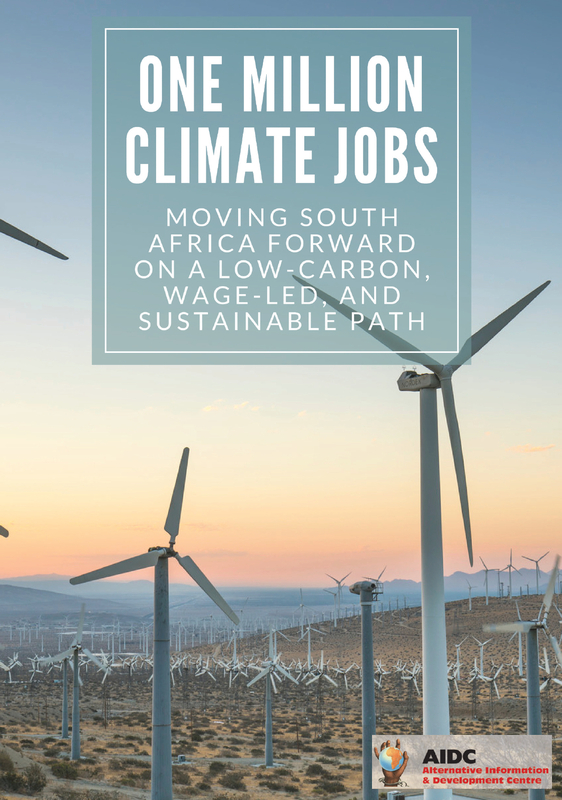 Zanozuko Sicgau has publicly supported the mining and N2 Toll Road and in 2013 wrote letters to Sanral and the TEM’s social assessment facilitator respectively, expressing his support for the projects. A member of Zanozuko Sicgau’s council is a director of Xolco and TEM and was made the sole director of Keysha Investments a month before MRC announced it was selling its stake in TEM to Keysha. The Amadiba chief, Lunga Baleni, together with his wife and an Amadiba headman, are Xolco Directors. Baleni is also a director of TEM. This is just the surface of the web of companies and directorships occupied by relatives of state officials, traditional authorities and business people. The Umgungundlovu Traditional Authority, however, has stood firm against both the mining and the road. This has earned its Headwoman, Cynthia Baleni, the wrath of Chief Lunga Baleni and a threatened existence as she has suffered repeated acts of intimidation and apparent threats on her life, starting with what has become known as the “Christmas Shootings” in December 2015. The ACC have thus drawn clear links between the proposed mining and road project, the kingship dispute, and state support for the project. There is simply too much elite vested interest in the project for the community to trust the moratorium as being motivated by concern for their well-being. 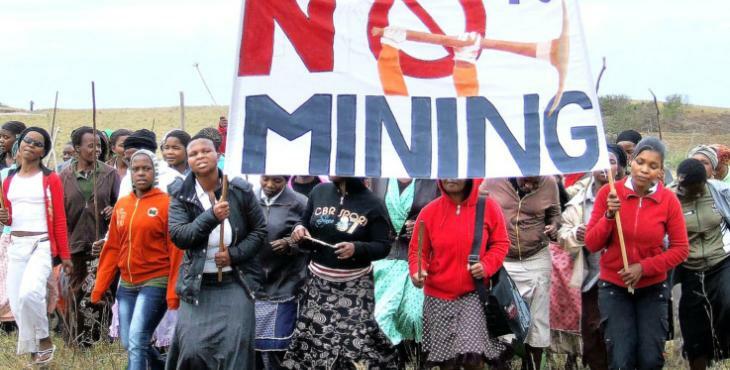 The provisions of the Mining Charter should therefore be considered in light of these class struggles between a foreign mining company, an indigenous pro-mining class and a rural community. The Amadiba case illustrates that, rather than creating a black industrialist class with resources repossessed from ‘WMC’ and foreign mining companies, and from whom national development may then spring, the Mining Charter is likely to simply bring the enemy closer to home and deepen the struggle between a small domestic class of rapacious accumulators and the majority of working class and poor South Africans, especially those who live and depend on land endowed/cursed with precious metals. This approach to “empowerment” also pushes to the margins more people-driven and democratic approaches to addressing the country’s drastic social and economic inequalities. Airing her frustrations over the Amadiba’s refusal to accept the mining and N2 Toll Road on their land at a Premier’s outreach meeting at a school in one of the Amadiba villages in July 2013, then Eastern Cape premier Noxolo Kiewiet said that the Amadiba “will have no development because they are against development”. Through Amadiba Crisis Committee (ACC) and the Umgungundlovu Traditional Authority, the Amadiba have resisted the proposed mining and N2 Toll Road through open mobilisation like mass attendance at meetings to confront state officials, alliance building with other community organisations and progressive NGOs, extensive media engagement, and have forged a formidable legal defence through their lawyers. But community members have also undertaken spontaneous yet sustained actions in their daily lives to defend the very soil of their existence. The threat of mining and a national highway has intensified the Amadiba resident’s determination to show that they already possess solutions to their developmental challenges. They have deepened some of their existing practices and fused them into practices of resistance. 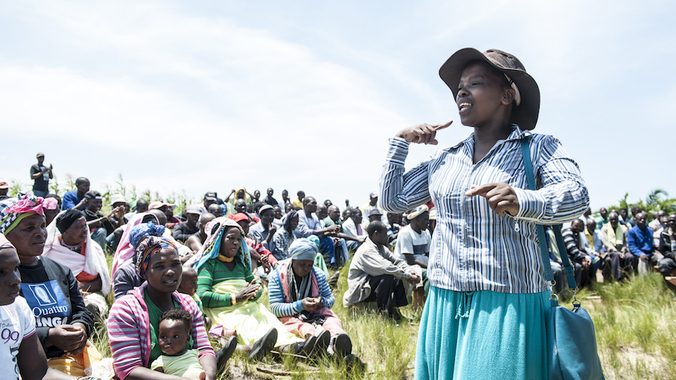 In Sigidi, the northern-most village of Umgungundlovu, community members say that in order to justify the mining and the road, members of government and mining and N2 supporters publicly advance the narrative that the people of Umgungundlovu are so poor that they do not even have the resources to work the vast amounts of land lying idle in their villages and hence are badly in need of development that mining would bring. Historically community members have vigorously contested the labelling of them as poor and the alleged under-usage of land as a myth. Nonetheless, Sigidi villagers decided that to further counter such narratives and defend their land, they should actively increase its usage through agriculture. This has taken two forms. The first is increasing the amount of land in the village that is farmed. 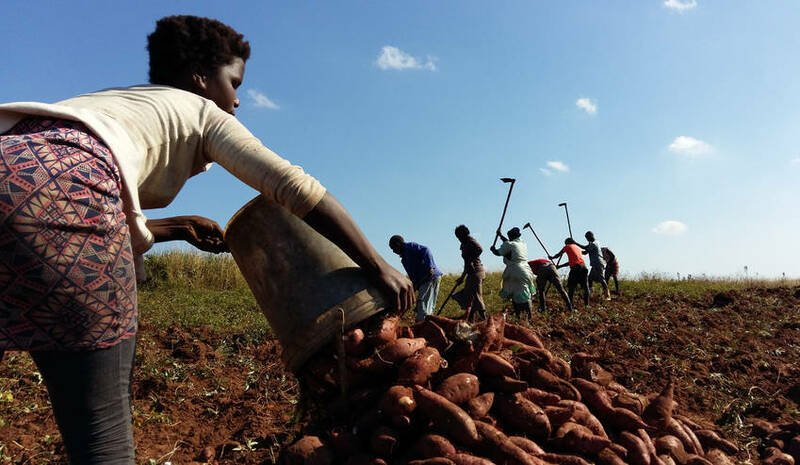 Whereas land was always used for agriculture as a key basis for survival in the area, even more land has now been ploughed and planted with sweet potatoes and amadumbes that are then sold to a buyer who picks the harvests up by truck and delivers them to a market in Durban. The second form was to spread the village’s cattle grazing practices to farther reaches of their land. At a village meeting it was decided that a fence needed to be built between the village and the grass-covered dunes that, if the miners had their way, would one day be mined. After the Department of Agriculture was approached for support but to no avail, fence poles were cut from the forest and households each contributed an amount to finance the purchase of fencing wire. Villagers constructed the fence from the southern border of the village at the Mphahlana River all the way to the northern boundary, where a deep gorge lined with indigenous forest opens up into a wide estuary that spills the contents of the Mzamba River into the Indian Ocean. The village itself is now emptied of grazing cattle during the day, but remains filled with the buzz of sweet potato harvesting, busy chickens and villagers going about their daily activities. The cattle spend their days grazing along the dunes and as the sun lowers in the sky they walk to the gate in the fence in their now daily ritual, where they wait for their owners to fetch them and herd them back to their kraals. In this sense, the Sigidi villagers have deployed agriculture as a tactic of resistance, giving literal expression to the notion that “resistance is fertile”. Tactics like these represent a particular form of stern defiance against the plans of a fledgling business class and state elite that, to them, has long severed itself from their humble desires: to keep their land, to decide what to do with it, to welcome others to appreciate it with them, and to be assisted in a forward-looking approach that seeks to build on it rather than destroy it. And in so doing, they are contesting the very project that the Zupta phenomenon represents, at the coalface of its manifestations, and showing us the seeds of a different direction for society. 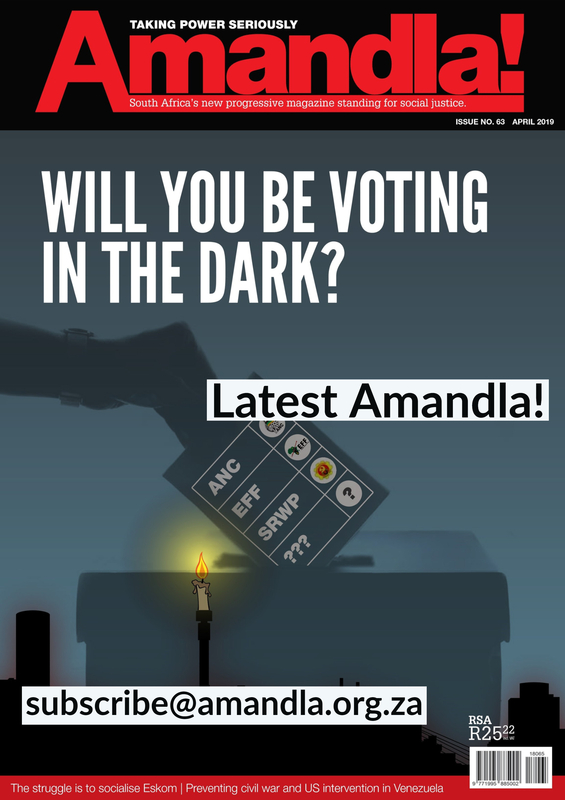 With or without the Guptas a particular parasitic path of class formation looks set to continue in the near future, but the Amadiba case gives hope that resistance will, too. And it needn’t be mentioned the spanner that organised resistance, arising out of the central spaces of people’s lives, tends to throw in the works of the powerful. This article has originally been published by the Daily Maverick.